There are so many reasons to celebrate this week! No, not because we are in the depths of busy season…but because this week is filled with birthdays!! Brandon’s birthday was next on the calendar, and he asked for a banana cake. 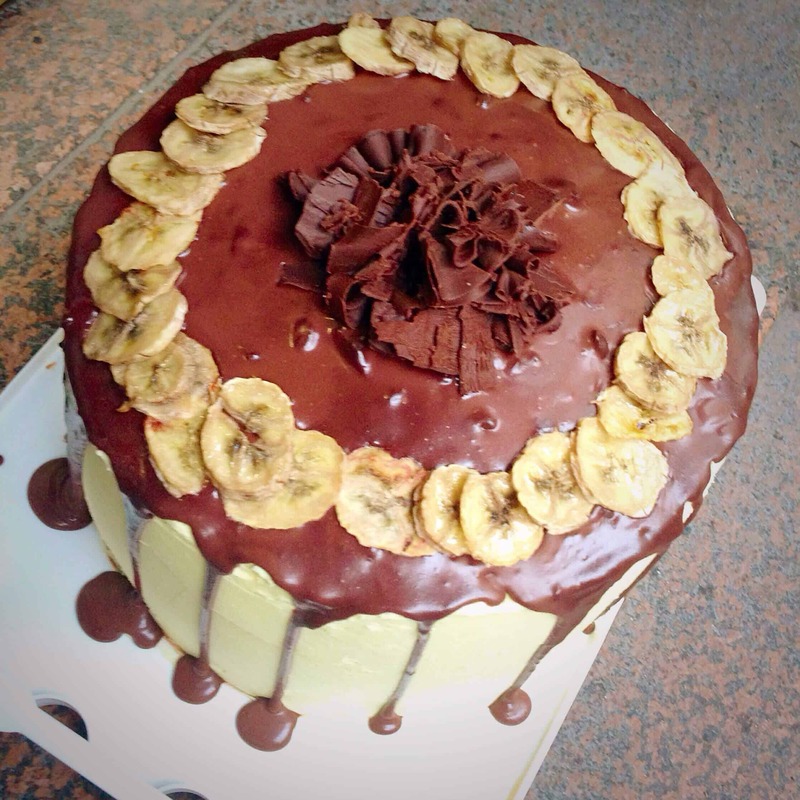 I was thrilled when he said he would like a chocolate banana cake, because it’s a flavor combination I’ve never tried before. So here it is! I used my favorite banana cake recipe, threw in some chocolate chips, and frosted the cake with a chocolate buttercream. Begin with the banana cake base. Preheat oven to 275°. Butter, flour, and place parchment paper circles in four nine-inch, circular cake pans. In a small bowl, mix the mashed banana with the lemon juice, and set aside. In a medium bowl, mix the flour, baking soda and salt, and set aside. In a large bowl, cream butter and sugar, until light and fluffy. Add the eggs, one at a time, followed by the vanilla. Slowly incorporate the banana mixture in the batter, then alternate the flour mixture with the buttermilk. Pour the batter evenly between the prepared pans, and bake for about 45 minutes, or until a toothpick inserted in center comes out clean. While the cake layers cool, prepare the chocolate buttercream frosting. Place the chopped chocolate in a heat-proof bowl, and bring the cream to a boil. Pour the hot cream over the chocolate pieces, and let this sit for a minute. Stir thoroughly for two minutes, until the mixture is fully combined. Set this aside until it has cooled. In a separate bowl, Beat the butter until it is light and fluffy. Mix in the salt, then add the powdered sugar in three installments. Stir in the vanilla, cocoa, and melted chocolate. Add additional powdered sugar or cream as needed, until desired consistency is reached. With every post you guys just blow me away. Do you know that your blog has turned me into an aspiring pastry chef/baker . . . not in the professional sense, but I have never been a baker of cakes, sweets, etc. and now am wanting to make all these beautiful creations! This is gorgeous!!! Wow!! I am always so impressed by what you make! Such a beautiful and delicious-looking cake! This looks amazing! Love the combination of delicious flavours! The cake came out fine but it wasnt as sweet as i expected it..